In our recent history, Nepali chhoris have been doing the country proud by making their mark felt across the world. We have prominent women leaders in the social sector, the economic sector, and the political sector, who together serve as great role models. One such woman is President Bidya Devi Bhandari. The trajectory of President Bhandari’s political career is in many ways reflective of Nepal’s progress in women’s empowerment. An active politician from an early age, she served as the Treasurer for the Federation of Student’s Union (FSU) while in college. President Bhandari then played a pivotal role as the Chairperson of the women’s wing of the General Federation of Nepalese Trade Union (GEFONT) from 1993. Today, she heads our nation as the first female President, inspiring women around the world. As a tireless advocate of gender equality, the President has been invited to address the International Labour Organization’s (ILO) World of Work Summit on the issue of women at work. This annual gathering of 187 states in Geneva in the middle of June will see representatives of workers, employers and governments from around the world. The struggle for representation and voice of women in all sectors has of course not been easy. Although more women take paid employment today than ever before, the underlying nuances need to be carefully understood. Data from the World Bank indicates that Nepal’s Female Labor Force Participation Rate (FLFPR) was 80 percent in 2016. But if you delve deeper, it appears that women have a long way to go to achieve gender equality. The Nepal Labour Market Update (2016) partially attributes the increase in the FLFPR to the male out-migration. With more men leaving the country, women are stepping up to take jobs in agriculture. In cases where women access jobs beyond agriculture, these are usually low and semi-skilled jobs. There are also big gender wage disparities: a study of 83 countries found that women earn 10-30 percent less compared to men. Moreover, most of women’s unpaid work is hardly accounted for. The 2011 Nepal Demographic and Health Survey Data finds the main reason cited by women for not working as having small children to look after (32 percent), not being allowed by their family to do so (19 percent) and heavy workload at home (19 percent). The ILO’s World Employment and Social Outlook: Trends for Women 2017 finds that there are significant labor market gaps between the two sexes, and closing this gap would yield significant economic benefits. However, progress of women in the world of work, in terms of the number and kind of jobs they have access to, has been slow. 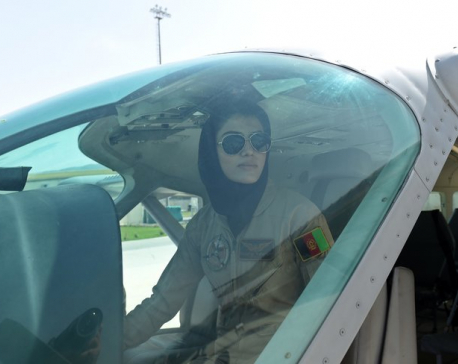 The report finds that this may be because of the socio-economic and gender constraints. The ILO therefore includes Women at Work as one of its centenary initiatives, providing an important opportunity to understand, examine and reflect on the obstacles to decent work for women, and what is needed to overcome such obstacles. The World of Work Summit, that the Nepali President will be addressing, will be an important part of this initiative. Although there is certainly more work to be done in our quest to achieve gender equality, Nepal has been taking steps in the right direction. This is indicated in the world’s recognition of Nepal’s commitment to gender equality: our support of the Convention on the Elimination of all Forms of Discrimination Against Women (CEDAW), the Beijing Platform for Action, the Millennium Development Goals (MDGs) and the Sustainable Development Goals (SDGs). 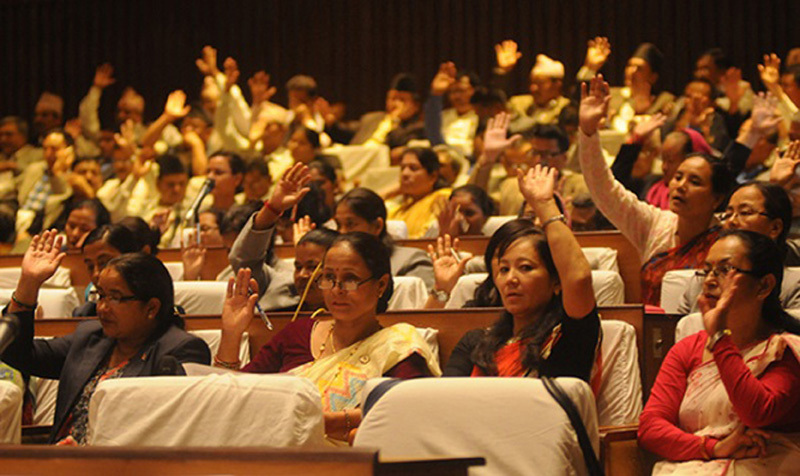 There has also been an increase in women’s rights to political participation, including 40 percent women’s representation at local level, 33 percent women’s representation in national parliament, women’s access to property rights, to education, health, employment and social security, and to labor market, with the FLFPR for Nepal highest in the region. With these small but significant steps, Nepal is doing its fair share to put itself on the global map. In many ways, the President’s invitation to Geneva is testament to the fact that the struggles of the women of Nepal have not gone in vain. It reassures us that Nepal sets an important example for the global community, with women occupying important leadership positions in the country. As President Bidya Devi Bhandari embarks on her journey to address this summit, we wish her the best. We also rest assured that our collective voices will be echoed through her as she addresses important policy makers on how best to make the world of work inclusive for all. 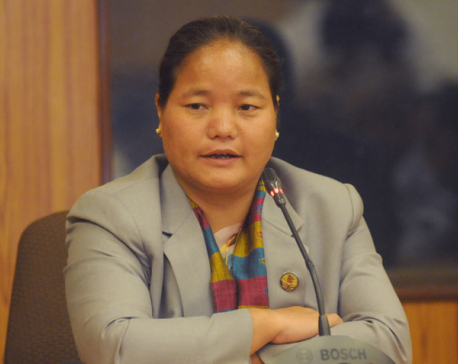 KATHMANDU, April 3: Speaker Onsari Gharti has said the Nepal's constitution has granted opportunities for equality to all Nepali citizens.